1 of 5 Heat oven to 375 degrees . Place a rack in a baking pan; coat rack with nonstick cooking spray. 2 of 5 On a flat work surface, place chicken between sheets of plastic wrap and pound to 1/4-inch thickness. Remove top sheet of plastic wrap and season top of chicken with salt and pepper. Place an equal amount of cheese and ham on chicken and roll up tightly from a short end. 3 of 5 Place egg whites and mustard in a shallow dish and whisk to combine. Place panko in a second shallow dish. Roll chicken in egg mixture and then in panko, covering all sides. Place on prepared rack, seam side down, and spritz with nonstick cooking spray. Bake at 375 degrees for 30 minutes or until chicken is cooked through. 4 of 5 Prepare hollandaise mix following package directions, using 2% milk and yogurt spread in place of butter. 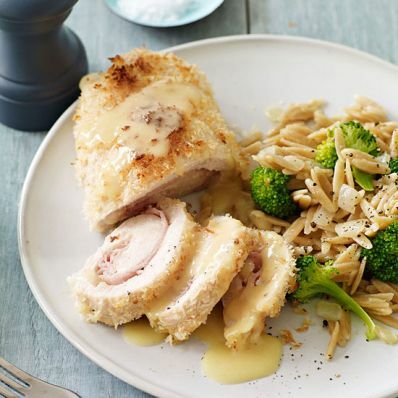 5 of 5 Serve chicken with sauce and, if desired, Orzo and Broccoli Pilaf (recipe at right). Per Serving: 42 g pro., 1 g fiber, 38 g carb., 7 g sat. fat, 781 mg sodium, 104 mg chol., 16 g Fat, total, 471 kcal cal.